Home » Plugins » WPForms Review 2019: Is It the Best WordPress Contact Form Plugin? Tired of building contact forms with bloated and buggy WordPress plugins? Chances are you haven’t tried WPForms, the most beginner friendly forms plugin in the WordPress ecosystem. In this WPForms review, we’ll take a look at its features, addons, and what makes WPForms the most intuitive WordPress plugin in the market. Every WordPress website requires a contact forms plugin, regardless of its niche or traffic. Using a contact form will protect you from spammers and hackers. You can keep your WordPress site more secure by using a contact form instead of displaying your email address. This way, you’re protecting your email from spammers who send unwanted offers and phishing emails. Using forms also saves you time. By using a contact form, you can specify what necessary details you’ll need to know when your visitors and potential customers are reaching you out. A good contact form plugin will also allow you to integrate extra features such as an email newsletter subscription checkbox in your contact form. This helps you to follow up on prospects and build a long-lasting relationship with them. 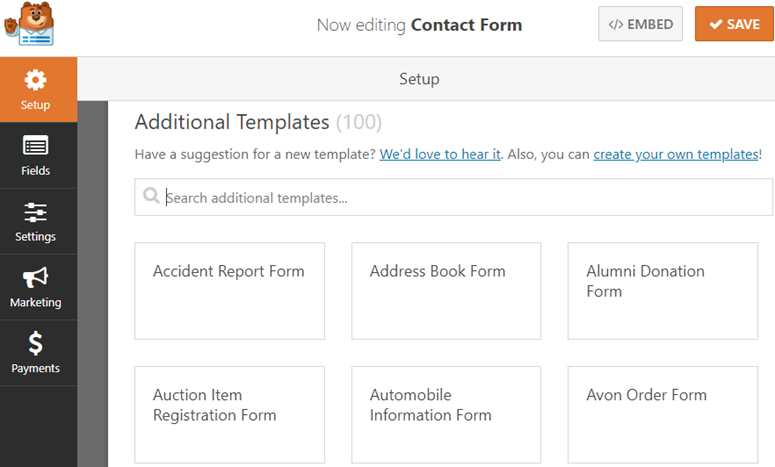 Building online forms in WordPress has never been easier thanks to WPForms. WPForms often claims to be the most beginner-friendly WordPress form builder in existence and hugely emphasizes the convenience it offers to build a WordPress form. With WPForms, you don’t have to hire a WordPress developer or even touch a single line of code to create a WordPress form. You should be able to create a form in a matter of minutes no matter you want to create a simple contact form or a complex form, like registration or payment form. With WPForms’ easy-to-use drag and drop builder, you can create any kind of forms in just a few minutes without having to touch any code. 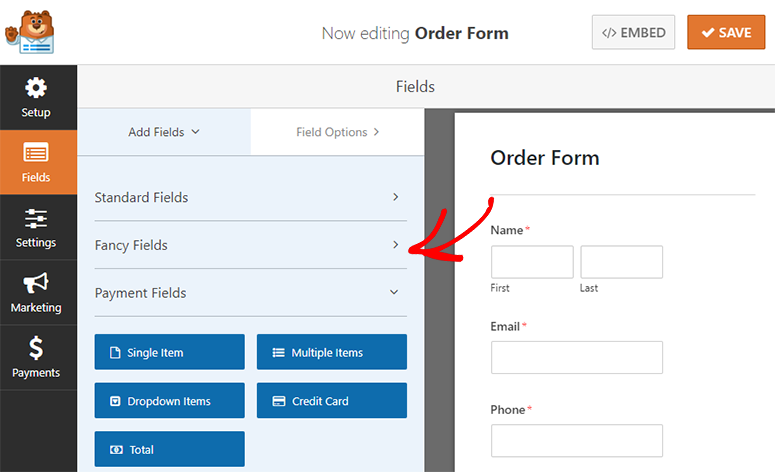 Adding and removing form fields can be done in just a single click. Plus, you can easily rearrange the fields per your needs with drag and drop. Want to create a WordPress form tailored to your industry or niche without having to build it from the ground up? Then you have to install the Form Templates Pack addon. The Form Templates Pack addon lets you choose from a huge variety of pre-built templates for every industry. That means regardless of the industry you’re in, you can find the right form template in WPForms. This saves you time as you don’t always have to build a form from the ground up. Instead, simply search for the form template you want to use and once it appears, click on it. Your form should now be created instantly. After making the necessary changes, you can go ahead and publish the form. To embed a form in a post or a page, you’re not required to copy and paste the shortcode manually. Rather, head over to your post/page editor where you want to publish your form. Click the Add Form button which you can find just above the text editor. A modal popup will now appear asking you to choose the right form. Select the right form and hit the Add Form button. With WPforms, building advanced form on your WordPress site is a breeze. Let’s take a look at a few examples of how WPForms enables you to build advanced WordPress forms quickly and easily. The Surveys or Polls addon enables you to quickly conduct a survey or poll on your WordPress website. In addition, you also get best-in-class survey reports with WPForms. When combined with conditional logic, you can even personalize your survey questions based on users’ responses. WPForms also enables you to publicly share your results on your website or with your followers on social media. If you’re running a community powered site like membership sites, forums, niche social networks, or any other sites that require users to register an account, then you might want to create a custom login form on your site. The main benefit of creating a custom login or registration form is that you can embed it anywhere on your site. This way you don’t necessarily have to direct users to the default login page. By creating a custom login page, you can display a consistent brand to your users, giving your site a more professional appearance. Whether you want to accept online donations for your nonprofits or need to collect payments for digital downloads, WPForms makes that easy for you. You can accept payments via PayPal Standard or Stripe integration. WPForms also allows you to display images of your products in the order form, giving users a visual look at what they’re ordering. Do you want to accept user generated content on your site? With WPForms’ Post Submission addon, you can accept user generated content, like guest articles, user reviews, testimonials on your site without having to provide the backend access to each user. 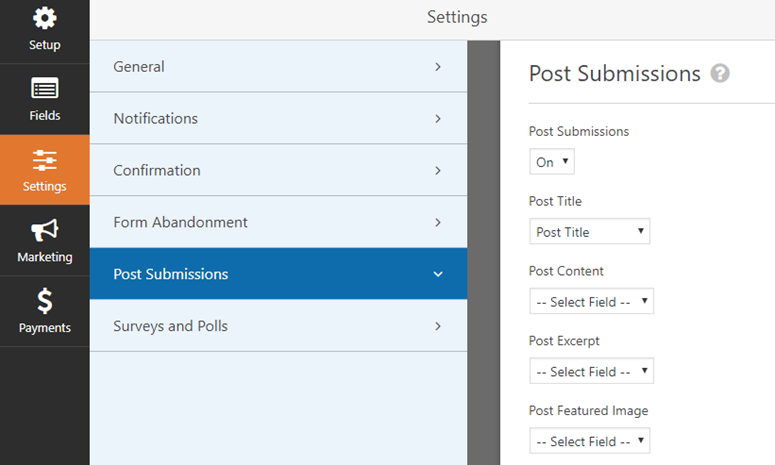 When a post is submitted through your post submission form, it will appear in your post editor for your review as a new pending post. After making the necessary changes, you can publish or even discard the post. WPForms comes with all the set of features out of the box, without the bloat. All field types are categorized into 3 separate sections: Standard Fields, Fancy Fields and Payment Fields. Standard Fields comprises basic field types Name, Email, Single Line Text, Paragraph Text, Dropdown, Multiple Choice, etc. Fancy Fields consists of fields like Phone, File Upload, Website / URL, Page Break, Captcha, etc. Payment Fields contains fields including Credit Card, Total (amoun), Single Item (payment), Multiple Items (payment), etc. WPForms is highly optimized for web and server performance to ensure maximum speed. Every form you create is 100% mobile responsive, so your forms will always look great on all devices. Best of all, you can easily embed your forms anywhere on your site whether it is blog posts, pages, sidebar widgets, footer, etc. All you need to do is to grab the shortcode and paste it where you’d like to embed the form, or use the built-in widget. With WPForms, you’ll also have the ability to create multi-page forms, allow file uploads, display or hide fields with conditional logic, and much more. WPForms also has a wide variety of addons that lets you extend its built-in functionalities and integrate with other popular email marketing tools and cloud apps. Let’s take a look at some of its addons below. Custom Captcha: Combat spam form submissions by enabling Custom Captcha. You can specify either your own questions or random math questions. Geolocation: Collect and store your website visitors’ location data along with their form entry. 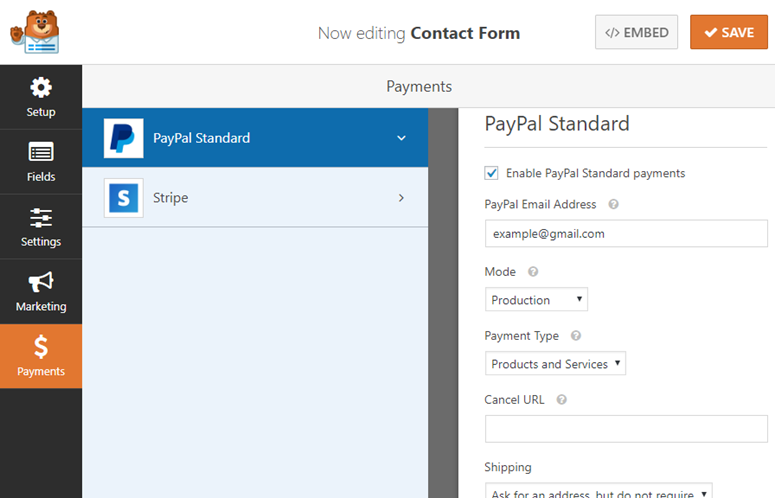 Payment Processors: Create donation forms or order forms by integrating PayPal and Stripe with your form. Post Submissions: Create a front-end post submissions form and start accepting user generated content like guest posts, user reviews, and more without your visitors having to log in. Signature: Create a contract form or agreement form and allow users to sign it online with their mouse or touch screen. User Registration: Create a custom user registration form and embed it on the most convenient location, so users can create an account on your site without visiting the default login page. Zapier: Connect your form with 500+ web apps. With this addon, the integration possibilities are endless. Surveys and Polls: Build surveys and forms and analyze the data with interactive reports. Form Abandonment: Connect with your leads even if they abandoned the form halfway. Offline Forms: Save forms data in the browser while offline and submit the data when the internet is restored. Form Templates Pack: Choose from a huge variety of pre-built templates to save you time. The best thing about WPForms is that it’s best suited for websites of all sizes and budgets. Whether you’re running a blog, small business, non-profit organization, eCommerce business or any other website, you’ll find the WPForms plugin immensely helpful alike. If you don’t have a budget for a contact form plugin or want to test drive the basic features before spending on the premium version, you can start with the lite version, which is available to download for free from the official WordPress plugin repository. The pricing for the full version starts from $49 for a single site license. Additionally, you’ll get access to the Form Templates Pack addon. Their most popular plan is Pro, which gives you access to all addons for 25 sites and priority support for a year, which costs $199. They also offer an Agency plan for unlimited sites, WordPress multisite support and client management feature for $349. Support is offered by ticket based email support system. WPForms support staff is fast and highly rated in user reviews. All the features and addons are well explained in their extensive documentation, with step by step tutorials and easy to follow guides. WPForms was built with a single goal in mind: build a WordPress plugin that’s both easy and powerful, so even an absolute beginner can create WordPress forms without having to hire a developer. The forms created with WPForms are incredibly fast and SEO friendly. The drag and drop builder makes form creation a breeze. Best of all, it allows integration with various tools like email marketing tools, payment processors, web apps and other useful addons. We can confidently say that WPForms is the most beginner friendly WordPress forms plugin in the market. We give it 5/5 stars. Here is the breakdown of our review scores. Can it be set up like glassdoor, for instance, where users log in and rate a company and then those results can be shown on a WP page? So if it were facebook and there were 5 responses, you could scroll through all five? 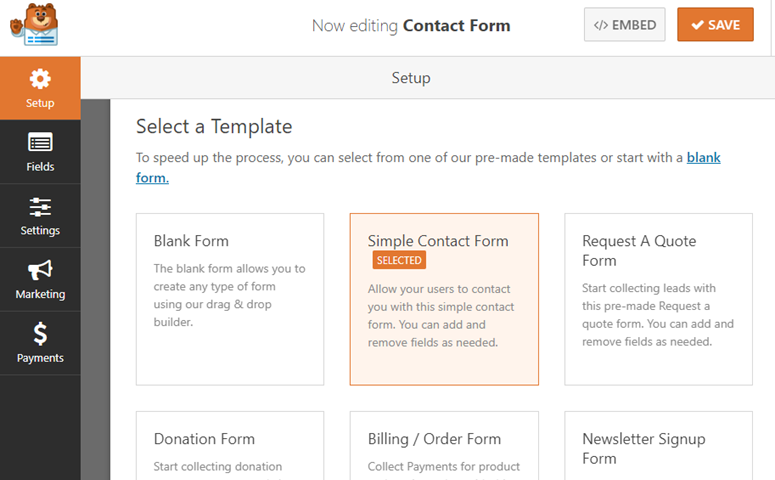 WPForms is a contact form plugin. 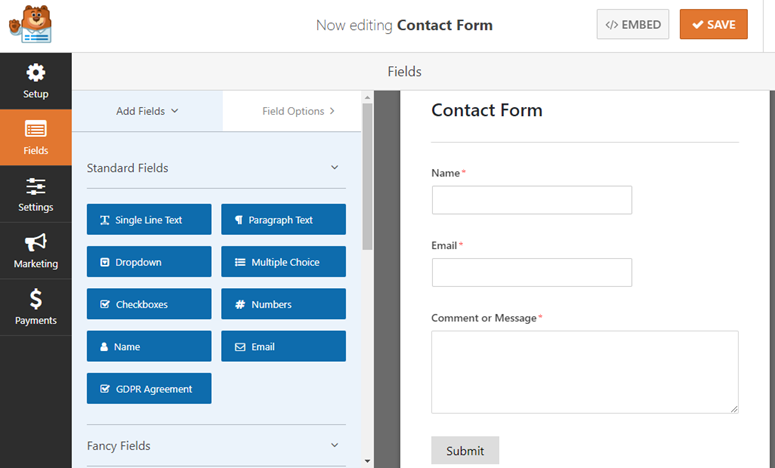 Not sure what you want to accomplish with a contact form plugin, but if you’re looking for an advanced form plugin that lets you create an online application, then Formidable Forms could be the best choice. Read our Formidable Forms review. Does the Stripe integration support multiple currencies? WPForms provides seamless integration with Stripe through the Stripe addon. And Stripe supports processing payments in 135+ currencies, meaning you can charge customers in their native currency with WPForms. Can’t set valurs via query strings for but a few field types. Can’t separate name or address fields into individual elements in email marketing integrations. Can’t sync checkbox or radio options to email marketing without extra email side workarounds. This form plugin is good if you need a simple contact form on your site but not much more… yet. It does have a relatively clean up, and Support is fast to respond, which is nice, but if all they tell you is that they’re adding something it’s missing to a future feature request that tells you it’s not ready for prime time. There are other more polished form plugins with more functionalities and similar or lower price points. 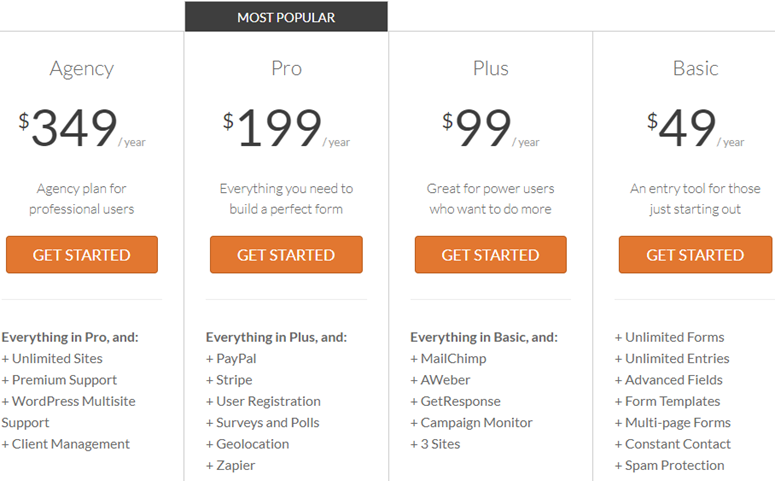 WPForms boasts about being the best “beginner-friendly” WordPress form plugin. For an advanced, feature-rich solution, you can choose Formidable Forms instead.